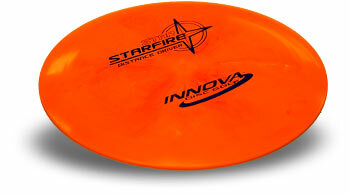 The Starfire is a great disc; this stable driver flies like a dream. Don't try to pass it as a short range disc; although it is accurate, if you miss it will keep flying. This disc loves to glide! It handles great and does well in the wind. It is great for long straight shots, and can perform in beautiful long hyzer and s-shots. The Starfire often does me a favor and skips on landing, gliding an extra 5-20 feet further after first contact. It fades quickly enough when thrown poorly so you can get back on track without too much repercussion. Overall, the Starfire is a pretty nice driver. I give this disc an A.